transportation, part 1: earliest days. Background research at urbancreek.com continues on a near-daily basis. The great difficulty in telling stories about Minnehaha Falls is locating their edges. Bits of these tales come bobbing down the metaphorical creek, plunge over the lip of the cataract, and float downstream to meet the river. People and stories come to the Falls, though their tales might begin or end elsewhere. In that light, then, a bit about transportation. This is a big topic about which there is quite a lot to say. 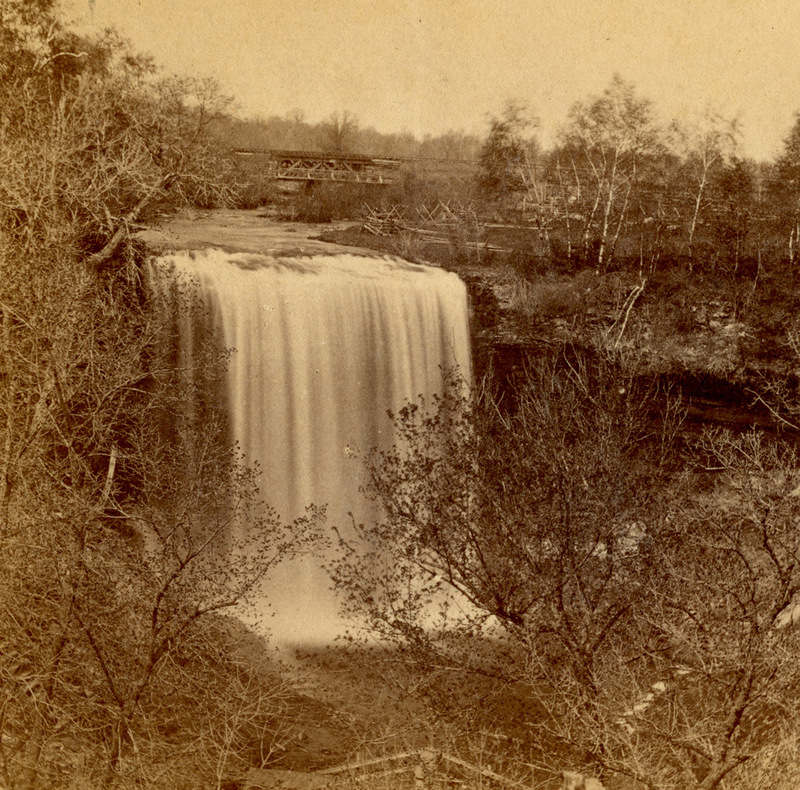 Facing west: an early picture of Minnehaha Falls, taken in or after 1865. The north side of the creek, behind that zig zag fence, had been privately owned since the early 1850s.–from the urbancreek.com archives. In those early days the territory was not yet organized and there were nearly no roads at all. Only a few thousand European-American people (those in the Army along with non-native settlers and traders) lived in Minnesota. Most of the land was empty and nearly all of it was owned by Native Americans. Back then, how did all of these new people get to Minnehaha? Walk the mile from Fort Snelling, or take a horse… those were the obvious easy ways to get to the Falls in those earliest frontier days. A closer look into the depths of this image shows a railroad bridge just behind the smaller bridge. 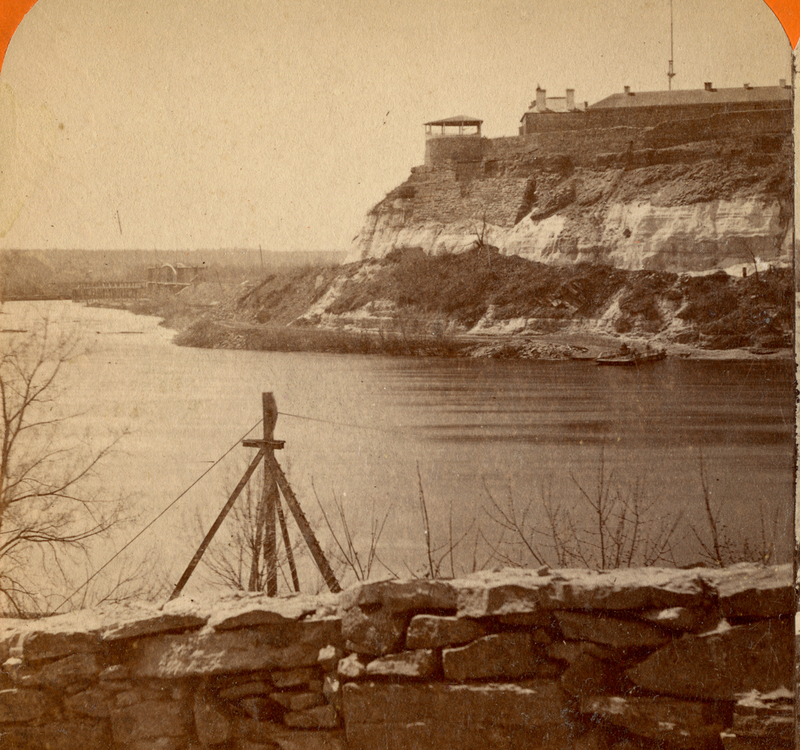 The Army at Fort Snelling likely built that first bridge for foot and carriage traffic between the Fort and St. Anthony Falls. It was either that, or they routinely waded the creek, and that was unlikely to be anyone’s first choice during most of the year. The railroad first crossed the creek in 1865. But the most charming of all our recreations was a ride to “Little Falls” now “Minnehaha.” The picture in my mind of this gem of beauty, makes the sheet of water wider and more circular than it is now, I know it was fresher and newer, and there was no saloon there then, no fence, no tables and benches, cut up and disfigured with names and nonsense, no noisy railroad, no hotel, it was just our dear pure “Little Falls” with its graceful ferns, its bright flowers, its bird music and its lovely waterfall. And while we children rambled on the banks, and gathered pretty fragrant things fresh from their Maker’s hand, listening the while to sweet sounds in the air, and to the joyous liquid music of the laughing water, there may have been some love-making going on in the cozy nooks and corners on the hill side or under the green trees, for in later years, I have now and then come upon groups of two, scattered here and there in those same places, who looked like lovers, which recalled to my mind vividly what I had seen there long ago. That enchanting spot, so dainty in its loveliness, is hallowed by a thousand tender associations and it seems more than cruel to allow its desecration by unholy surroundings and various forms of vice. Standing beside it now, and remembering it in its purity, just as God made it, my eyes are full of unshed tears, and its mellifluous ceaseless song seems pleading to be saved from the vandalism which threatens to destroy all its sweet influences and make it common and unclean. Throughout the 1850s, great changes began to come to Minnesota. Though the railroads had yet to enter Minnesota, in 1854 the expanding national network of railroads reached the Mississippi, meeting the river at Rock Island, Illinois. It was an important accomplishment, and was ably celebrated with The Grand Excursion. Over a thousand people took “the cars” to Rock Island and then steamboats to St. Paul to see the Minnesota frontier. Once in St. Paul, they hired horses and carriages to take them sightseeing to St. Anthony Falls, Minnehaha Falls, and Fort Snelling. 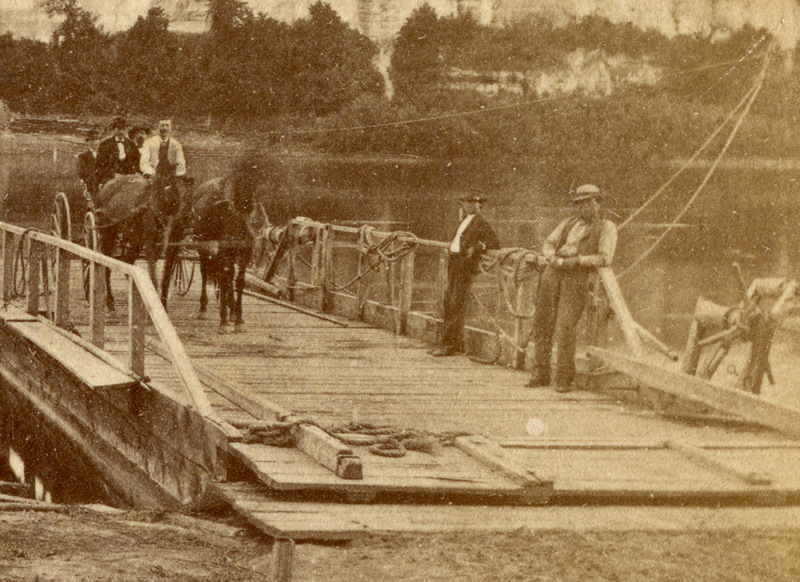 The excursionists crossed the river at St. Anthony Falls and at Fort Snelling on rope ferries. 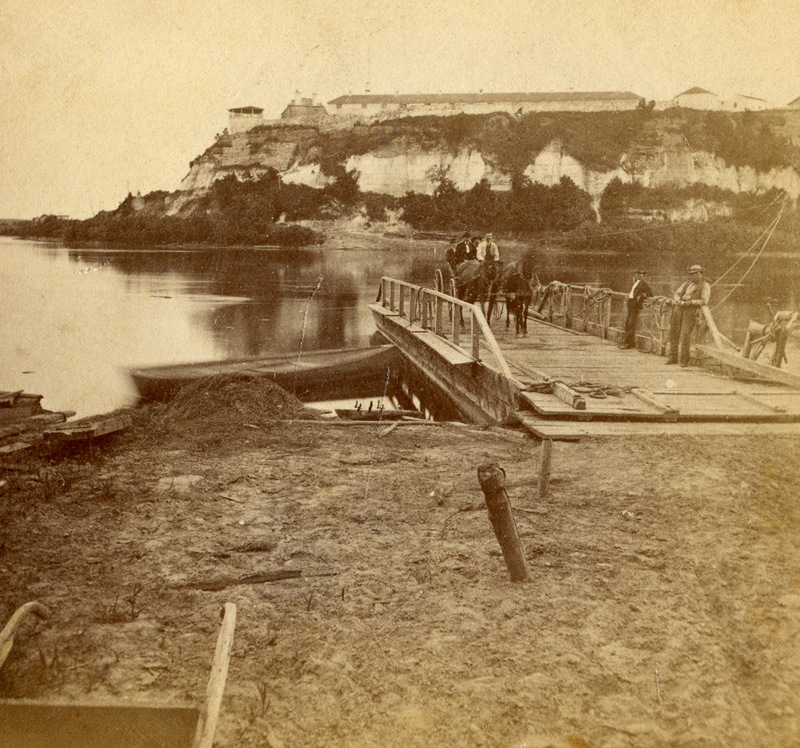 The rope ferry at Fort Snelling. Here the ferry is just putting a wagon ashore on the east side of the Mississippi. 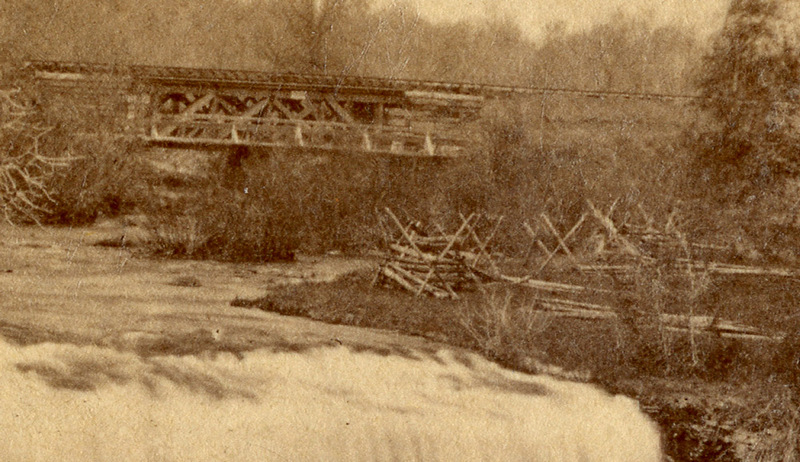 .–An 1860s picture from the urbancreek.com archives. The rope ferry used the river’s current to propel the ferry from one side of the river to the other, following a stout rope or cable strung from bank to bank. Early versions of this technology relied on the current and hand-over-hand pulling the ferry along the cable to the far side. The Fort Snelling ferry across the Mississippi used both the river’s current and a winding mechanism to move the ferry. The winding winch is visible at both ends of the ferry. And the rope strung across the Mississippi is also clearly shown. 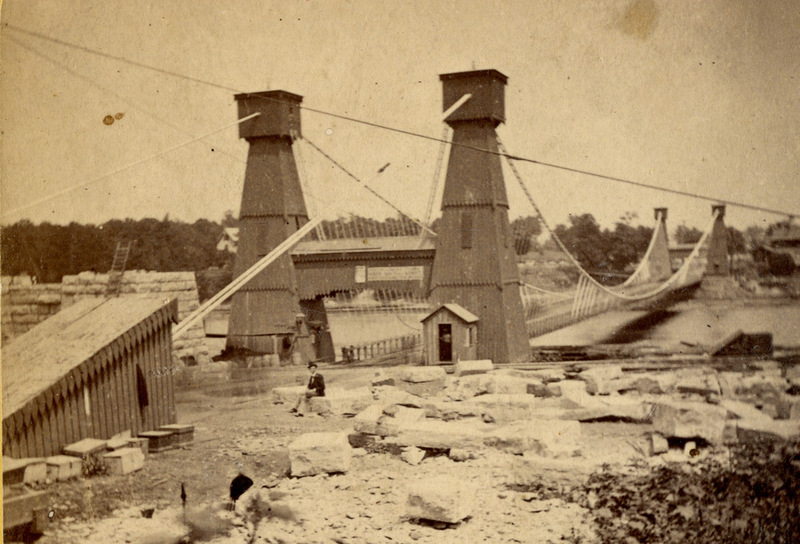 In 1855, the first-ever bridge across the Mississippi opened at St. Anthony, replacing the rope ferry that had been in use above St. Anthony Falls. This bridge connected the towns of St. Anthony and Minneapolis. And it definitely aided subsequent tourists taking the “Grand Rounds” tour (of St. Anthony, lakes Harriet and Calhoun [now Bde Maka Ska], then Minnehaha and Fort Snelling). The Minneapolis park system still thinks of its best circuit as The Grand Rounds. That new bridge, though not appearing to be flimsy, was said to sway dangerously in high winds. Warning signs were posted on it right away. “Heavily loaded teams” were to cross the bridge 100 feet apart. And anyone riding or driving fast than a walk would be fined $10. This was a lot of money in that time. The actual fare to use the bridge was 5¢. 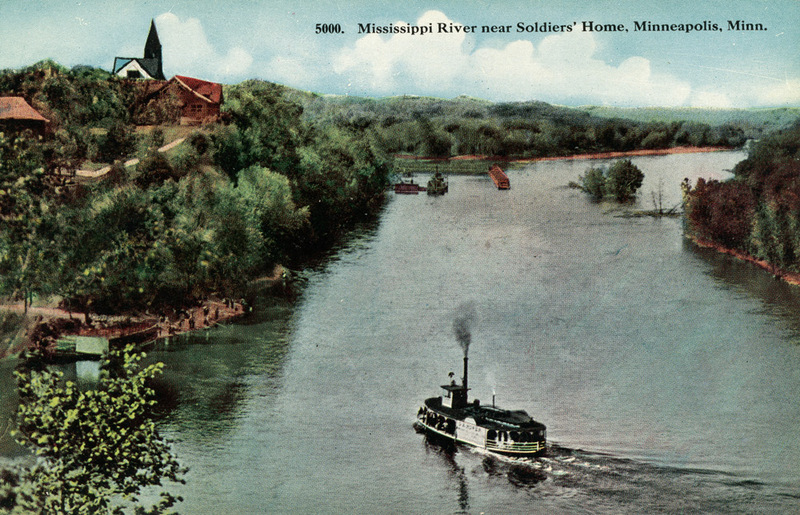 Years before statehood was conferred on Minnesota in May of 1858, visitors could also reach Minnehaha by boat. Pioneer Ard Godfrey had a claim along Minnehaha creek downstream of the Falls and was milling lumber there as early as 1853. “Godfreysport” was the landing he built to ship out lumber and later grain. That landing was in use for decades, including long after his claim had been sold as a location for the Soldier’s Home. And thus, from quite early on, it was easy to disembark a steamboat from the Fort or from St. Paul at the mouth of Minnehaha Creek and walk upstream to view the waterfall. The steamboat “Gracie A. Mower” makes for the Godfreysport landing. Postcard from the urbancreek.com collection. The steamboat landing was in use for more than 50 years, well into the 20th century. An unanswered question: since there was a cable across the river downstream at Fort Snelling, how did steamboats get past it to the mouth of Minnehaha Creek and the Godfreysport landing? On the top of the bluff on the east bank was a tripod supporting the ferry rope. This is a long way above the water. (For extra fun, notice the superstructure of the train bridges crossing the Minnesota River. ) This picture is from the urbancreek.com archive and dates from the 1860s or 1870s. The rope was anchored on a tripod on the St. Paul side of the river. There was certainly some similar arrangement on the opposite side, though no picture has yet come to the attention of urbancreek.com. This means that the closer to shore, the higher the rope. Perhaps steamboats making the run upstream to Minnehaha Creek were able to slip past underneath. Or, something as simple as a pole could have been used to raise the rope just high enough for the smoke stack to pass. Author karenPosted on October 9, 2018 December 4, 2018 Categories mysteriesTags 1850s, 1860s, Ard Godfrey, Charlotte Ouisconsin Van Cleve, first bridge, Fort Snelling, Fort Snelling Ferry, Gracie A. Mower, pioneers, railroads, Soldiers Home, south stairs, steamboats1 Comment on transportation, part 1: earliest days. April 17, 2019: Woodlake Point Condominium Assoc. “Robert Fischer: the Sand Man of Minnehaha Falls” (time TBA). May 22, 2019: Westminster Presbyterian Church. “Robert Fischer: the Sand Man of Minnehaha Falls” 10:30-11:30. 1200 Marquette Avenue, Minneapolis. June 1, 2019: Sibley Historic Site. “The Rowdy History of Minnehaha Falls” A site tour will be conducted at 10, and I will be speaking from 11:15 to 12:15. 1357 Sibley Memorial Hwy, Mendota, MN. Pavilions at Minnehaha, part 1. Stephen Leigh on transportation, part 1: earliest days.